I went around the corner to a neighbor’s garage sale and paid $1 for an old coffee can. 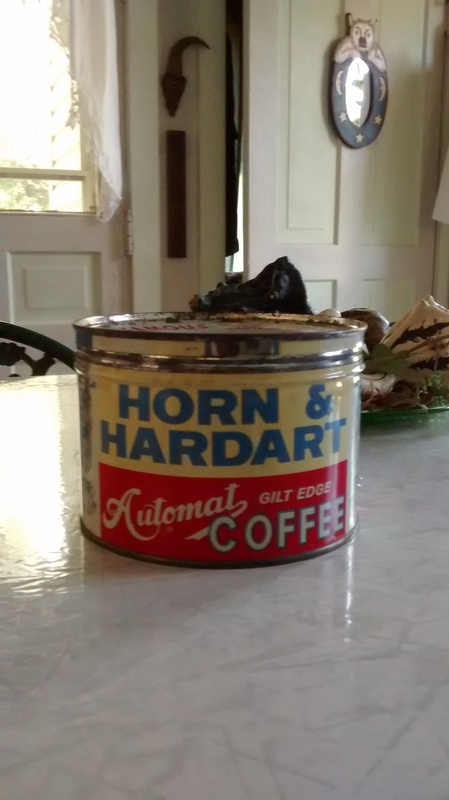 It was just an interesting old can to them, but to me it was a can of memories, cos I was there….at Horn and Hardart, 60 years ago….looking back 60 years, thru the eyes of a little girl…to about 1953. Long story short, my dad was a wood pattern maker, but nobody anymore knows what that means. /https://sarasinart.net/2015/05/22/my-sundial-made-by-an-exalted-craftsman/ Sometimes local pattern shops would run out of work and the workers would go away to cities to work at bigger pattern shops, usually for months at a time. My dad went away several times, to work in Philadelphia, 2.5 hours away from home. He would stay in a rooming house all week and come home on the weekends. I was about five, living an insulated life of a small child in a small town, so small it still doesn’t have any traffic signals; just stop signs. My dad knew there was a bigger life out there cos he had been all over Europe and Africa in the Signal Corps in the Army in WWII. He didn’t have any trouble blending into a big city. He would come home with wonderful things and wonderful stories. I remember him bringing huge, delicious pickles that were wrapped in wax paper and he said they came from a barrel. I had never had any pickles as good as they were. Later I learned they were those big Kosher dills. He brought home some butter that was different than any I had ever tasted, and I liked it on toast. Later I learned the difference between salted and unsalted butter. He said he got those things at a big market in Philadelphia. Later I learned that was Reading Terminal Market. He brought good cheese and some bolognas that I had never tasted anything like too. And a box of crayons for me that had more colors in than I had ever imagined. Several times he came home one day early and took my mother and me to Philadelphia to see what the big city was like. My mother had never been to a big city either, born and raised in the next small town down the road from where we lived. We went to the market where he got the pickles and I saw them in the barrels. And I saw so many things there that were just wondrous to a little child. I remembered the good smell from inside this huge market that seemed to me to go on forever and ever. Later, as an adult, I have visited the market several times and the same smell came back to me immediately, just as I had remembered it. 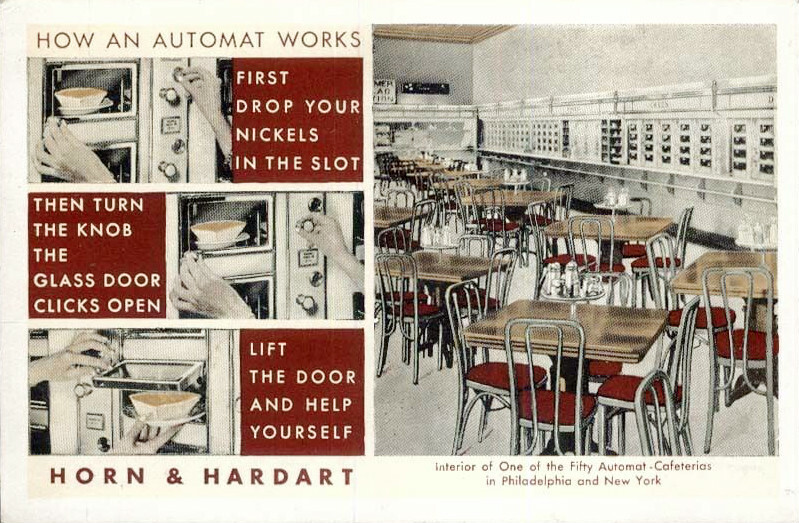 He took us to a place he called the Automat. I didn’t know what that meant, but he said I’d like it. In a huge room were little glass doors along a wall, and there was food behind the glass doors. I got to pick which food I wanted and I got roast beef and mashed potatoes. My dad put coins in beside the door and the door opened up, and he took out the roast beef. 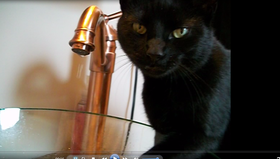 He and my mother got their food too, and we put it all on a tray that slid along rails in front of the glass doors. At the end of the rails were bundles of napkins wrapped around forks and knives. Then there were tables to sit at and lots of people getting their food and eating. He told me the other name of the place and I didn’t remember it till we talked about it as I was older, and after I was old enough to remember the name, I never forgot the words Horn and Hardart. He was amazed years later that I remembered it so well since I was so little, and even remembered what I got to eat. We all have early and first memories, and they can be very vivid. Sometimes things leave big impacts on a small child who’s encountering something unlike anything else that has happened in her life. I remember all that like it was yesterday. Ah yes, just as I remember it. Thanks for the can full of memories at your garage sale, Bruce. $1, so well spent. Thank you so much. When you get older, you’ve accumulated a lot of stories. Nice story, glad you shared it with us. Thanks. That coffee can sits on a shelf in the kitchen among some other old memories. Thanks Jackie. It’s good to write some of these things down to tell people, and remind myself, of how things used to be. I hope you soon get past some of your issues. Thanks Nancy! I’m working on it. I remember those big pickles floating in the barrels…AND…they were good! I had forgotten about that, because I haven’t seen any in a very long time. Do some old, small stores still have those? It would be my guess that, with all the concern over things being tampered with, there are no pickle barrels anymore. I haven’t seen a pickle barrel in years. Probably from just what you said, fear of tampering or contamination.